By Tim McManus·	 12/30/2013, 6:52 a.m.
Arlington, Texas — It was clear from the early going that Nick Foles was going to have a better day this time around. 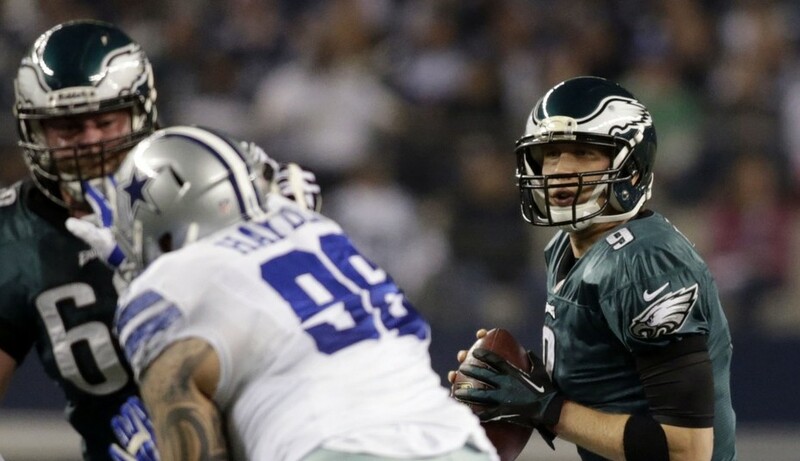 The biggest game of Foles’ young career — a Sunday night showdown in Dallas for the NFC East crown — happened to be versus the same Cowboys team that he struggled badly against two months back. That 11-for-29, 80-yard performance, which ended with a concussion, left the quarterback’s future in Philadelphia uncertain. What followed was one of the more remarkable stories of the year, with Foles leading the Eagles to wins in six of seven games down the stretch while amassing unbelievable personal stats, some 0f which only Peyton Manning and Tom Brady have matched. And now here came the Cowboys again, with the playoffs on the line. It took less than a quarter for Foles to surpass his numbers from that October 20th game. He ended up 17-of-26 for 263 yards with two touchdowns, no interceptions and a 124.4 quarterback rating in the Eagles’ 24-22 division-clinching win. Foles finished the regular season with a quarterback rating of 119.2. That’s not only tops for the 2013 season, but the third-best QB rating for a season in NFL history (Aaron Rodgers – 122.5 in 2011, Manning – 121.1 in 2004). He threw 27 touchdowns and just two interceptions on the season. That is the best TD/INT ratio in NFL history. Foles did most of his damage in the first half, as 197 of his 263 yards and both TD throws came in the first two quarters. The Dallas defense put heavy pressure on him after intermission. Outside of an 11-play, 60-yard touchdown drive that was carried by the Eagles’ ground game, the offense was kept in check late. Foles lost a fumble at the beginning of the half. But he, like his teammates, weathered the storm, and were able to survive and advance.